In the Ace of Cups card, there is a hand emanating from the clouds holding out a cup, as if in a offer to the querent to take a drink. This cup is overflowing with sparkling water which symbolizes pure and pristine emotion. If you take this offer, drinking from this cup will surely bring you nothing short of emotional as well as spiritual fulfillment. The cup has five streams of water overflowing from the brim. These five streams represent the power of intuition and show the importance of listening to your inner voice. In order to obtain the kind of emotional or spiritual fulfillment that is depicted in the Ace of Cups, the querent will need to follow this inner voice, and remain true to it, regardless of the situation. This will require emotional discipline, but the rewards that this can bring are hinted at within the card itself: overflowing joy and happiness. Getting the Ace of Cups upright shows that it's time to let loose of whatever emotional baggage you have and start living your life to the fullest. Like with all the other aces, there is a new beginning that is indicated here - a chance to start fresh. It might come in the form of opening yourself up to the possibilities of new relationships, romantic or otherwise, that have the ability to make you emotionally fulfilled. The release indicated by this card may either be spiritual or emotional, depending on what you are going through. The Ace of Cups may come to a reading after a long period of being lonely or enduring something that deeply hurt you emotionally, and it's appearance may be there to herald the turning over a new leaf. The release indicated by this card may either be spiritual or emotional, depending on what you are going through. It is important for one to open themselves to more opportunities for friendships, love and spiritual learnings. There is a chance now to put your past behind you, for you are being offered the gifts of the cups. It is up to you whether you take the cup and drink to the fullest. 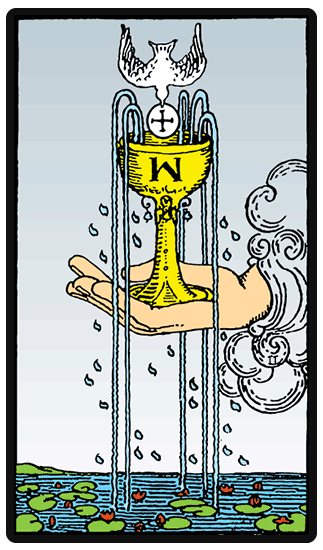 When the Ace of Cups is overturned, the image here is clearest - the waters pour out of the cup, it becomes empty, the gift of its waters are being wasted. Seeing the Ace of Cups upside down during your reading means you have been enduring emotional instability or pain for some time. There is a loss that is indicated here, and perhaps something that has meant much to you is no longer giving you the joy that it once had. Since the cups also govern creativity, you may also be experiencing a creative block of sorts, and where the waters of inspiration once flowed, they have now dried up. In all these cases you must examine who or what is in control of the cup - which party allowed it to overturn? What can you do to place it right side up again?